The Federal Reserve (also known as The Fed) is a central banking system that controls the monetary system of the United States. It was established by the Federal Reserve Act, which was passed by Congress and signed into law by President Woodrow Wilson in 1913. As it describes itself, "the Board is a federal government agency consisting of seven members appointed by the President of the United States and confirmed by the U.S. Senate." 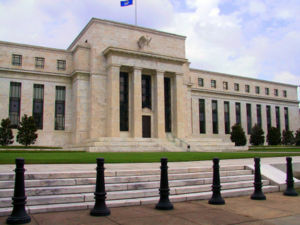 The Federal Reserve is a system of private banks, twelve of which are designated as Federal Reserve Banks and have some features of public federal agencies. The Federal Reserve is headed by a Board of Governors and a Chairman. The current Chairman is Ben Bernanke, a Republican appointed by President George W. Bush; his predecessor was Alan Greenspan, a Republican appointed by President Ronald Reagan. One of the main jobs of the Federal Reserve is to control inflation by adjusting the supply of money in the economy, while at the same time maintain the stability of the financial system and promote economic growth. This is done by buying and selling government bonds in order to influence banks' cash supply (called "open market operations"), setting the amount of money that banks must keep in reserve, and setting the interest rates for money it lends to banks (the Fed's lending facility is called the "discount window"). These three major operations are the basis of monetary policy, and are performed by the Fed to target a specific Federal Funds Rate that it believes will be low enough to ensure available credit and stimulate the economy, but high enough to prevent inflation. The Fed also has the responsibility of supervising and regulating banking institutions. In 2008 the Fed became a major player in many new ways, taking over several major banks (ostensibly to prevent total economic collapse) and making trillions of dollars in guarantees. See Financial Crisis of 2008. Federal Reserve banks are located in Boston, New York, Philadelphia, Cleveland, Richmond, Atlanta, Chicago, Kansas City, St. Louis, Minneapolis, Dallas, and San Francisco. Libertarians, such as Ron Paul, and many conservatives want to abolish the Federal Reserve. For 30 years Ron Paul has called for the secretive Federal Reserve bank to be audited. Ron Paul's website declares "Since the Fed’s creation in 1913 the dollar has lost more than 96% of its value, and by recklessly inflating the money supply the Fed continues to distort interest rates and intentionally erodes the value of the dollar." However, conservatives are not united in their criticism: the prominent conservative commentator Vox Day, a member of Mensa, describes himself as a "loyal Federal Reserve supporter". The Fed made the Great Depression much, much worse by utterly failing in its primary responsibility. It simply did nothing, as hundreds and thousands of banks failed (see bank run). What it was supposed to do was lend them enough money to keep going! Hafer, R. W. The Federal Reserve System: An Encyclopedia. (2005). 451 pp, 280 entries; ISBN 4-313-32839-0. Chandler, Lester V. American Monetary Policy, 1928-41. (1971). Kubik, Paul J. , "Federal Reserve Policy during the Great Depression: The Impact of Interwar Attitudes regarding Consumption and Consumer Credit." Journal of Economic Issues . 30#3. 1996. pp 829+. Mayhew, Anne. "Ideology and the Great Depression: Monetary History Rewritten." Journal of Economic Issues 17 (June 1983): 353-60. Wicker, Elmus. Federal Reserve Monetary Policy, 1917-33. (1966). Wicker, Elmus. The Great Debate on Banking Reform: Nelson Aldrich and the Origins of the Fed (2005). This page was last modified on 9 April 2019, at 07:06. This page has been accessed 31,335 times.